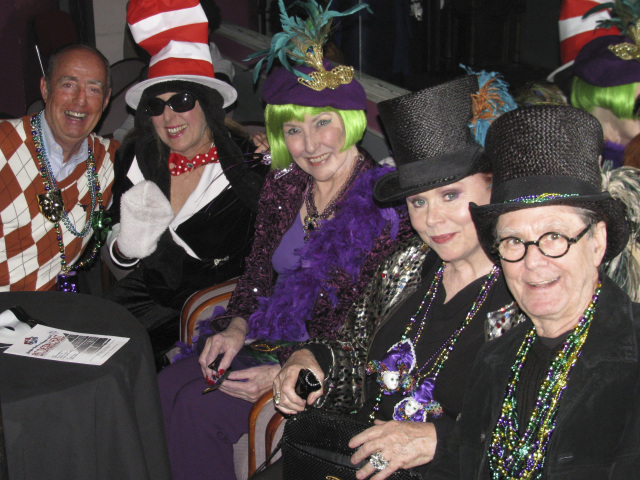 It may have been a week early with its billing as a FAT TUESDAY FEAST subtitled, “WAY DOWN YONDER IN NEW ORLEANS – A Musical Mardi Gras,” but the latest offering from Lone Star Lyric Cabaret certainly presented plenty of familiar tunes associated with The Big Easy. With the talents of Joseph Li at the piano and Grant Martin on drums, LSL founder, Kelli Estes, presided cheerfully from the stage as she and her fellow vocalists, Sarah Brindley, Andrew Reich, and deep-voiced Stephonne Smith took turns at the microphone in Houston’s Ovations Night Club. It was my first opportunity to hear Mr. Smith perform with LSL, but he is clearly what we call in show biz, “a keeper.” No wonder his résumé already includes work on Broadway, national tours with The Lion King, not to mention applying his deep, rich, bass voice to “Old Man River” in Showboat productions. His vast experience was immediately apparent, as he literally owned the stage during his LSL numbers, whether singing or softly addressing the audience between songs. A pro is a pro. The group’s song list for the evening included such classics as, “Jambalaya On the Bayou,” “Bill Bailey Won’t You Please Come Home,” “Lazy Bones,” “Black & Blue,” “Mood Indigo,” “Georgia on My Mind,” and, of course, the aforementioned, “Way Down Yonder in New Orleans. Fans who missed the show can stay tuned for LSL’s next offering, “MERCY, MERCER!” featuring the words & music of Johnny Mercer and scheduled for Friday March 28th at 8pm & Sunday March 30th at 5pm.